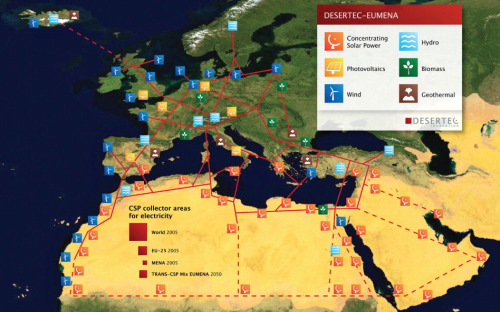 One initial template for development could be the Desertec Industrial Initiative (DII), which envisages North African solar and wind plants satisfying 15% of the EU's electricity by 2050. If supplemented by North Sea wind farms or Icelandic geothermal energy, Europe could become a hub for regional renewable energy consumption. The technology is already available but the business case has yet to be successfully made. Solar thermal power plants have operated successfully in California since the 1980s. Asia is rich in renewable energy potential for nearly every new technology; from strong sunlight in the Northern and Southern desert regions and wind in the middle latitudes to wave and tidal power off the coasts of China and Indonesia. The continent also has considerable geothermal and hydropower resources. Connecting existing resources with power lines and natural gas pipelines could create a highly-efficient Pan-Asian energy infrastructure that could increase supply security, enhance competition, enable fuel switching, improve price signals and reduce surplus capacity needs. Developing renewable energy resources and interconnecting the region's electricity grids could create huge efficiencies, but this requires a significant amount of investment into infrastructure from governments and businesses. To explain how a pan-Asian energy infrastructure might work, it helps to divide the region into three distinct geographic areas: Northeast Asia comprising China, Japan, South Korea and Taiwan; the 10-ASEAN states; and Australia. One initial template for development could be the Desertec Industrial Initiative (DII), which envisages North African solar and wind plants satisfying 15% of the EU's electricity by 2050. These 15 countries represent US$11 trillion worth of GDP and account for about one third of energy-related global greenhouse gas emissions. By 2050, Asia's economy is likely to be much larger and under current business strategies its greenhouse gas emissions will also have increased. The future of Asia will therefore determine to a great extent how successful the world is in battling climate change. A pan-Asian energy infrastructure plan offers one possible solution. In Northeast Asia, China has significant terrestrial wind and solar resources, Japan has geothermal energy and South Korea is developing wave and tidal power. All three countries burn coal and import natural gas from Australia and the Middle East. By increasing cross-border grid interconnections, aggressively developing renewable energy and replacing coal-fired power with cleaner-burning natural gas, Northeast Asia can make a sizeable reduction in short-term emissions while constructing future power grids and generation systems. Renewable energy sources would include Mongolian wind and sun, Japanese and Chinese geothermal energy and existing hydropower assets. Gobitec provides one example of this kind of thinking. Promoted by the Hans Seidel Foundation of South Korea in co-operation with the South Korean Environment Ministry, Gobitec envisages transmitting Mongolian wind energy to South Korea and Japan over long-distance, low-loss High Voltage Direct Current (HVDC) power lines. Similar ideas have emerged from the Asia Pacific Energy Research Centre (APERC) at the Institute of Energy Economics in Japan. The centre has proposed using HVDC power lines to carry hydropower from the far east of Russia to Northeast Asian power markets. The most exciting frontier for renewable energy in Northeast Asia may lie offshore. Joint research by Harvard University and Beijing's Tsinghua University estimates that North Asia has huge offshore wind potential. Atmospheric circulation patterns cause westward-travelling equatorial winds to hit the Chinese coast and redirect them Northeast towards Alaska through the East China Sea. Building offshore wind capacity to service the populous coastal areas of the four countries could yield huge amounts of power. Building transmission infrastructure to exploit this resource could also enable large-scale development of wave and tidal power. For their part, the ASEAN states fit neatly into this kind of scheme. With plenty of renewable energy resources of their own, the 10-nation group could play a significant role as renewable energy producer, consumer and network pathway. Indonesia has large undeveloped geothermal resources, the Philippines has wind and geothermal and the Mekong states have hydro and biomass. Malaysia and Indonesia also have sizeable conventional and unconventional gas supplies. As in Northeast Asia, the ASEAN states could engage in a short-term ‘dash to gas’ to replace aging coal-fired power stations as renewable energy is built up and national grids are interconnected. Australia could end up being one of the largest contributors and beneficiaries of a Pan-Asian energy plan, because the country has a breadth of renewable energy resources unrivalled in Asia. A vast amount of sunlight falls on Australia's largely uninhabited and undeveloped outback. Massive geothermal resources lie below the country's surface in some of the same areas blistered above ground by intense sun. Australia's southern latitudes brim with wind energy due to their proximity to the Great Southern Ocean. The country also has huge conventional and unconventional gas supplies. If it developed all these sources it could easily produce enough energy to power its own economy with plenty left over for export. Desertec Australia's roadmap calls for refocusing the country's electricity grid to generate outback-based renewable energy and eventually exporting some of that power to Asia. Researchers at the Tokyo Institute of Technology have suggested much the same thing; they believe huge concentrating solar power facilities in Australia could create both electricity and exotic fuels that could be exported. As elsewhere in Asia, Australia could rapidly reduce its greenhouse gas emissions by expanding its grid, developing renewable energy sources and engaging in a short-term ‘dash to gas’ to offset replacement of its aging fleet of coal-fired power plants. Later, it could connect its national grid to that of the ASEAN states, which in turn would be connect to those of Northeast Asia. 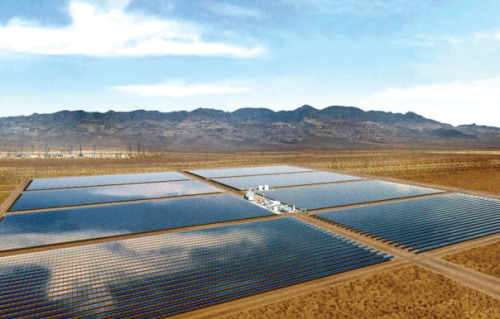 First Solar Inc has joined the Desertec Industrial Initiative as an Associated Partner to demonstrate the potential of photovoltaic (PV) solar technology in deserts. First Solar is the first pure solar PV company to join Desertec, which aims to provide a significant portion of the electricity for the Middle East and Northern Africa as well as Europe by 2050 via a network of solar and wind energy sources from deserts. As an Associated Partner of Desertec for an initial period of three years, First Solar will contribute utility-scale solar PV expertise in Desertec working groups and prepare the ground for reference projects and a roll-out plan. Firstly, cross-border electricity grid interconnections enhance energy supply security and create desirable competition through greater trade. This will lower regional prices and reduce the price distortions caused by autarkic national markets. Secondly, renewable energy of all kinds is expected to become financially competitive in the coming years as the implicit subsidy for coal of un-priced carbon emissions is eliminated. The absence of carbon pricing is one issue that contributed towards climate change and eliminating that market failure will go a long way toward solving the problem. And finally, building natural gas capacity to replace coal-fired power makes sense because it creates rapid short-term reductions in carbon emissions. Natural gas capacity can later be redirected to the higher value use of satisfying the ‘load balancing’ and ‘peaking power’ needs of future grids dominated by renewable energy. Having natural gas provide load power and then load-balancing power eliminates the long-term risk of building out new natural gas electricity-generating capacity. Mothballing coal-fired power plants also enables them to be used as insurance against unexpectedly high future electricity demand. Sidelined but maintained plants could be brought online for seasonal use if forecasts underestimate future electricity demand. In this way, mothballing extends the life of coal-fired power plants by giving them a constructive sunset role in a future grid dominated by renewable energy. The most fascinating element of a pan-Asian energy plan may well lie in the opportunity to bundle cross-border natural gas and HVDC transmission systems. Large new regional supplies of conventional and unconventional gas supplies are being developed across Asia. The default option is to transport this gas as technologically-inflexible, environmentally-questionable and energy-intensive liquid natural gas (LNG). Nearly US$100 billion of LNG compression facilities and associated port infrastructure are planned in Australia alone as the country moves to develop its North West Shelf gas fields and unconventional gas supplies in Queensland. Much of this gas is slated for shipment to Northeast Asia, but it makes sense for the country to export surplus electricity and natural gas supplies to the same customers in Asia, which would save money and infrastructure. ASEAN's efforts to deepen its natural gas pipeline interconnections through the Trans-ASEAN Gas Pipeline Project and other power grid projects provide a useful template for this issue. At present, the 10-nation grouping seems ahead of others in the region in appreciating the value of multilateral infrastructure. Pan-Asian energy infrastructure would offer a host of benefits, among which would be the price reductions and operational efficiencies expected from a co-ordinated regional common carrier network rather than a clumsy farrago of ad-hoc bilateral arrangements. To explain how pan-Asian energy infrastructure might work, it helps to divide the region into three geographic areas: Northeast Asia comprising China, Japan, South Korea and Taiwan; the 10-ASEAN states; and Australia. Ultimately, interconnection of national energy markets could create a single electricity market in Asia that could amount to 20,000 TWh in 2050. It could also lead to a regional natural gas transmission system capable of carrying 60 billion m3 per year able to operate as a single market for a fungible commodity. Energy sources would stack themselves in a carbon, distance and base load/peak load/intermittency-adjusted dispatch order into a regional smart grid. Geothermal and nuclear could provide baseload power. Renewable energy such as wind, sun, waves and tides would provide intermittent power and would be balanced by natural gas and hydro energy. In recent studies, both the Asian Development Bank and APERC have argued that poor infrastructure is holding back Asia's economic development. Both advocate huge investment in cross-border infrastructure and claim that the scope for gains is huge. The Desertec Industrial Initiative, the Trans-ASEAN Pipeline and the ASEAN Power Grid are just three templates for the system. Under the North Sea Offshore Grid Initiative, littoral states plan to create an offshore web of North Sea wind farms. The distances involved are not significantly different from those around the East China Sea as London and Oslo are roughly the same distance apart as Shanghai and the Japanese island of Kyushu. In terms of HVDC and natural gas bundling, the proposed Galsi pipeline from Algeria to Sardinia and Italy traverses the same Mediterranean ocean route proposed for Desertec. Over the coming years, engineering work on the Desertec Industrial Initiative may take advantage of these opportunities, providing Asia the opportunity to follow. Ultimately, a European natural gas network overlaid by HVDC interconnections for North African solar energy exports to Europe which connects into a North Sea Grid Initiative starts to look a lot like a Pan Asian Energy Infrastructure in miniature. The biggest difference would be the larger distances in Asia: roughly three times those in Europe. But with Asia's more rapidly growing regional economy the costs of a larger system may be easier to shoulder than in slower-growing Europe. Desertec-Australia estimates that Pan-Asian energy infrastructure may cost US$2-5 trillion. Much will depend on how it is built (for example, on land or by sea), how extensive its secondary routes are and whether it carries just electricity or includes natural gas. Assuming a cost of US$3.5 trillion over a 40-year construction period, annual regional expenditure would be around US$90 billion, or 0.8% of Asia's US$11 trillion GDP. This infrastructure plan combines the advantages of the theory of ‘comparative advantage’ with those of the ‘invisible hand of the marketplace’. Asia can develop a low emission future by coupling carbon pricing with frictionless transport and open markets. This is the same theory that created global supply chains, the internet revolution and the trade-led global living standard gains after World War II – the energy industry is simply lagging behind. Stewart Taggart is a director of Acquasol Infrastructure Ltd, a developer of environmentally-friendly power and water solutions. He is also founder and administrator of DESERTEC-Australia and DESERTEC-Asia.